Each new year is an opportunity for insurance agencies to look back, reflect, and consider where improvements could be made. Many of these improvements might require new technology for the agency. For the second year in a row, we conducted research to identify what technologies agencies are currently using and what changes they plan to make during this year. To determine this, we utilized a 24-question survey to ask questions regarding database management, commissions processing, and digital marketing and automation. Respondents were a combination of 1-2 man shops to 20+ employee agencies whose core business included groups, individuals, and seniors. These agencies sell health insurance, life insurance, P&C, annuities, voluntary products, medicare, and final expense. 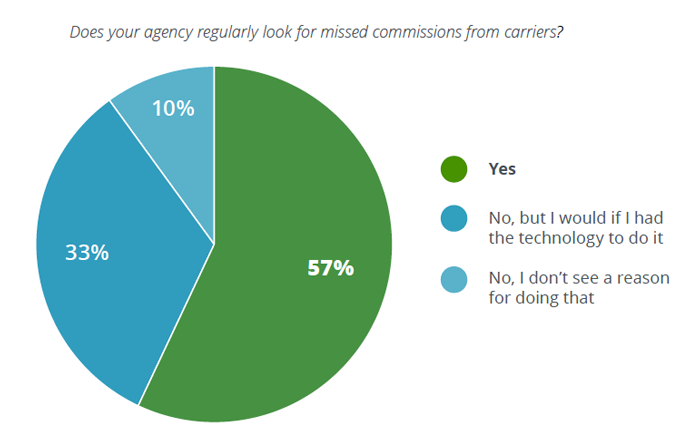 Most of these agencies process and track commissions in their agency—only 17% indicated they don’t. Findings from our survey suggest that, in 2018, agencies will be considering new technologies to better manage their book of business, more efficiently track and process commissions, and will continue to devote resources to digital marketing and automation. Currently, 74% of the industry is using some kind of software (as opposed to more manual formats, spreadsheets or paper). 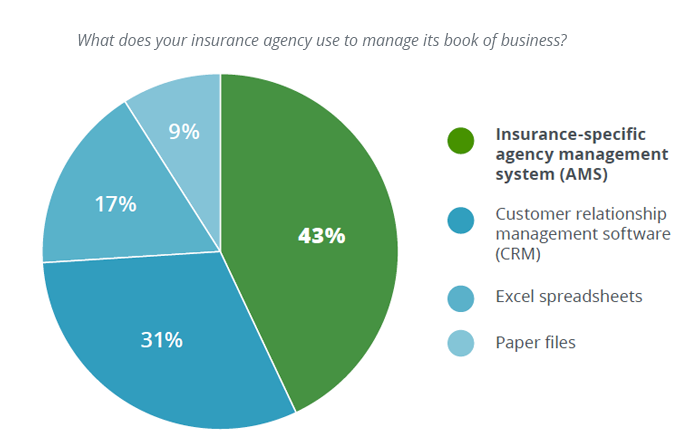 Forty-three percent are using an industry-specific AMS (agency management system), and 31% are utilizing a CRM (Customer Relationship Management software). If you are unsure of the difference between an AMS and a CRM, think specificity. CRMs are used by all industries to mainly track relationships with clients and prospects, whereas an AMS is insurance industry-specific. They track relationships, but they also meet other needs of insurance agencies like policy management, agent management, insurance-specific workflow automation, commissions tracking and processing, and insurance-specific reporting. Remember: an AMS is insurance-specific; a CRM is generic. This is why 44% of insurance agencies felt a significant increase in productivity when implementing an AMS. Unfortunately, over 25% of the industry is still stuck in spreadsheets and paper files. Both can be huge productivity and resource drains for agencies because they tend to be disorganized and time-consuming to maintain. They are also incredibly error-prone; 88% of Excel spreadsheets contain errors. There are several more reasons you should NOT rely on spreadsheets to manage your book of business. To learn more, read this: 7 Reasons You Shouldn't Use Excel to Manage Your Book of Business. What’s exciting is that even more agencies are planning to adopt an AMS for the first time this year (23% vs. 15% last year). Another 15% are planning a switch from their current system to another AMS. Choosing the right AMS is the battle. One of the biggest things to consider is how well you know the vendors you’re considering. You might not think of this upfront, but knowing the organization’s history, their experience level, and even their values is important. It’ll help you foresee the kind of relationship you’ll have with them AFTER purchase. So, how can you get to know your vendor in this way? It starts with a lot of online research: Google searches (31% of respondents said they do this first when considering new technology), perusing their social media profiles (especially LinkedIn! ), and checking testimonials/referrals. Then, ask your peers! Thirty-nine percent of people ask a peer for a recommendation first before anything else. What’s more: agencies indicated that referrals, online reviews, and the sales demos themselves influenced them the most during a technology purchase decision. So, do your due diligence getting to know the vendors. 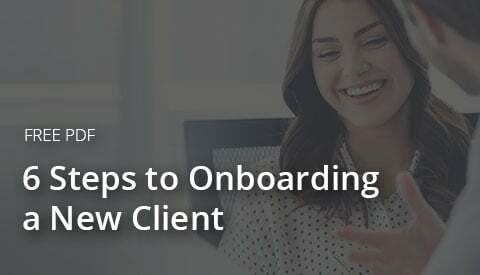 Get to know more people in the company than just your sales rep, especially the client services team. 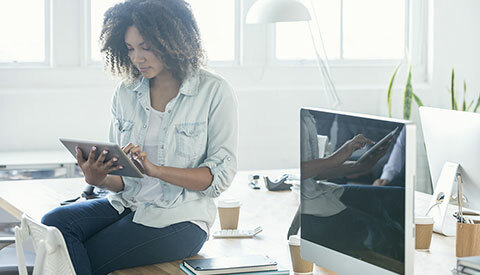 Overall, insurance agencies are already using software or are expecting to adopt new technology or switch vendors this year because they understand the relationship between the right technology and overcoming their day-to-day challenges. What is insurance agencies’ #1 challenge? 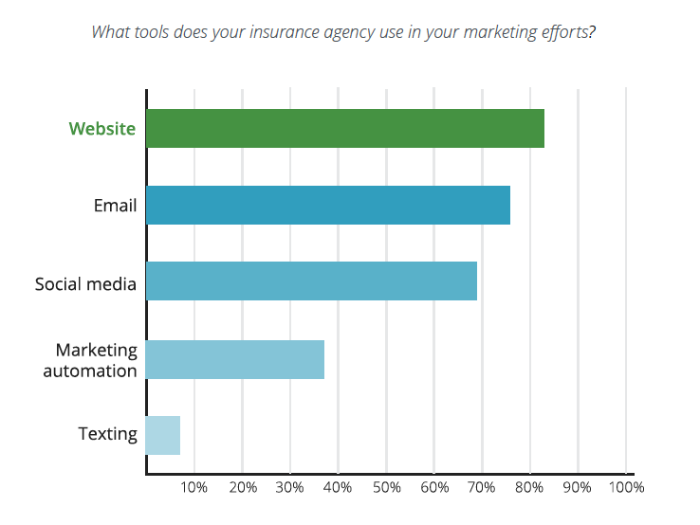 Lead generation continues to be insurance agencies’ #1 challenge from last year to this year (38% vs. 49%). Lead forms on your website integrated with your AMS are an easy way for prospects to reach out to you quickly. The important thing here is how quickly you respond to them. After all, 50% of sales go to the first person who calls, so you need the technology that will enable you to do that. When the lead form is connected with your AMS, you’ll see immediately when a form is filled out and can then act accordingly. In AgencyBloc, you can automate an email to the prospect right when they fill out the form assuring them you’ll be reaching out soon. Not all lead vendors are reputable; not all will yield positive results. This is another area where vetting the vendor is crucial. What’s also crucial is that the vendor integrates with your AMS, so you’re able to track the lead efficiently, just like your leads from lead forms. AgencyBloc integrates with NextGen Leads and ProspectZone, both well-known lead providers in the insurance industry, as well as a few others. When a lead comes in, it appears on the agent’s dashboard, and any related workflows are triggered so nothing slips through the cracks. To learn about how agencies are tackling the other challenges on this graph, check out the eBook! Currently, agencies are mostly using an AMS or spreadsheets to process and track commissions. 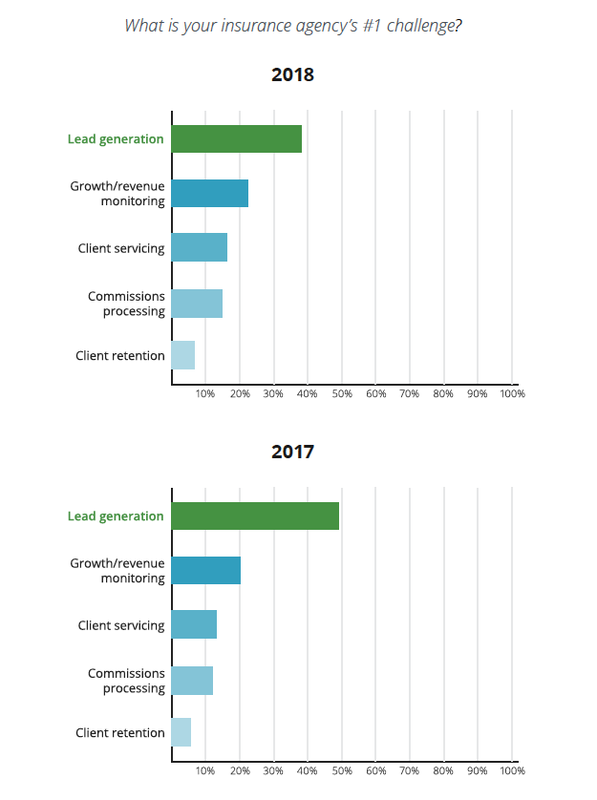 And, agencies who said they don’t process or track commissions at all is down 10% (27% last year vs. 17% this year). Like we mentioned above, spreadsheets have their issues: 4 Reasons You Shouldn't Use Excel Spreadsheets to Process Commissions. They’re typically full of errors and time-consuming, and they don’t offer an effective audit trail or any in-depth data analyzation. For these reasons, agencies are turning toward an AMS, like AgencyBloc, to process, track, and analyze commissions. Another reason is that it’s undoubtedly easier to identify missed commission payments within an AMS. Most agencies today are regularly looking for these, and, of those who don’t, the majority say they would if they had the technology to do so. Another reason is more insurance agencies are looking to project commissions and better analyze their revenue. Last year, 42% said they didn’t see a reason for projecting, but this year, only 27% said the same. More responded that they would if they had the technology to do so—30% this year vs. 11% last year. 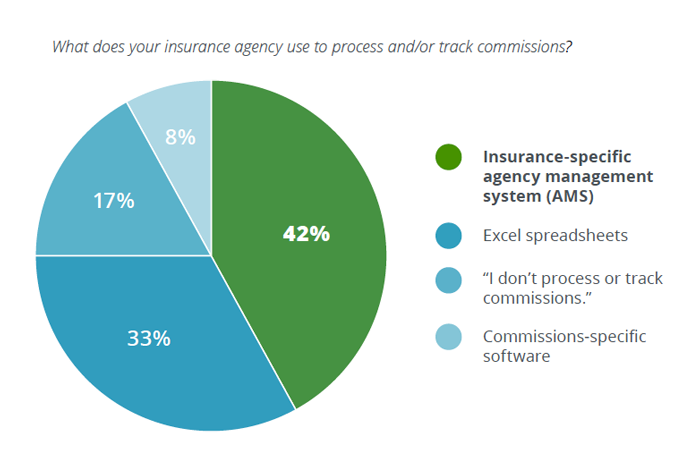 Our survey findings suggest that insurance agencies are seeking tools that will streamline their commissions processing, help them quickly identify missed commissions, and allow them to analyze their commission data. If you’re one of those agencies seeking commissions technology, check out AgencyBloc! When asked what tools they’re using, the majority are utilizing a combination of a website, social media, and email, and the use of marketing automation is up 10% from last year (37% vs. 27%). All of these marketing assets are important, and insurance agencies are figuring out how to devote more resources to marketing by utilizing workflow automation. 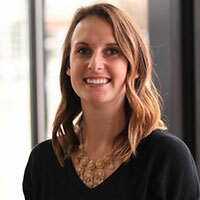 Marketing automation is really just a subset of workflow automation, and many agencies are utilizing automated workflow, in general, to make every part in their business run smoothly. Through automated emails and reminders, things simply get done in your agency without you micromanaging it all. 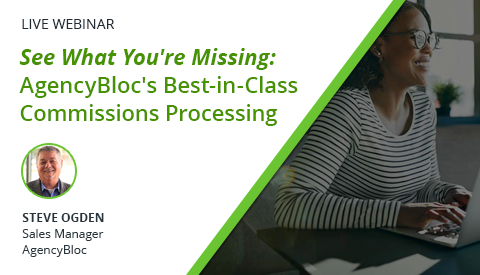 Learn more about how automated workflow could benefit your agency in AgencyBloc’s Tour. Every insurance agency is different, so what works for one agency for database management, commissions processing, and digital marketing won’t automatically work for yours. However, the important piece to take from this is that insurance agencies are increasingly turning to technology to create efficiencies in every area of their operations. 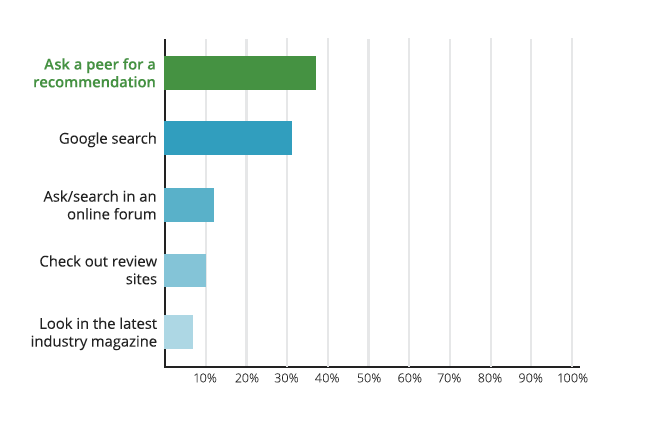 And, it’s becoming increasingly important to thoroughly research any vendors you’re considering. To continue your research in how to properly vet insurtech vendors, check out our blog: Is It Secure? The Questions You Should Ask Insurtech Vendors. Want to learn more about how an industry-specific agency management system can benefit your agency? Take a look at AgencyBloc's brief 5-minute overview!